This is a sponsored post, however all views and opinions expressed are my own. I received this item in exchange for my honest review. Most of you know me pretty well by now, and you know I love monograms. 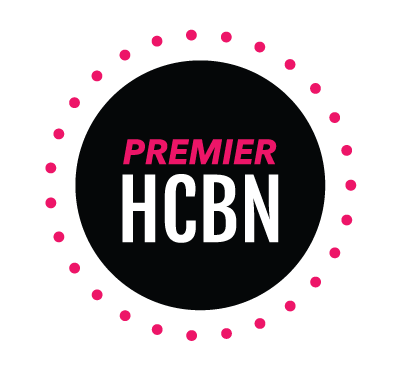 So when Christina of Christina's Monograms and I decided to collaborate, I was overjoyed. 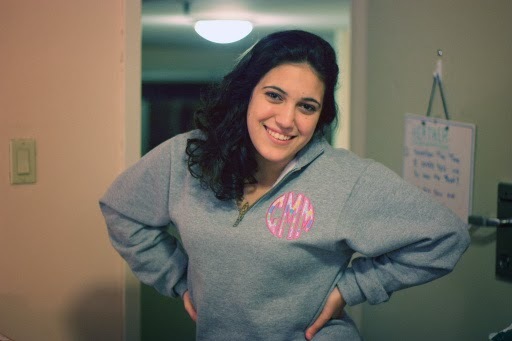 I was even more overjoyed when I discovered that the adorable and comfortable 1/4 zip sweatshirt she was sending me was monogrammed in lilly fabrics. Lilly lovers everywhere rejoice, because this adorable MUST-HAVE item is only $35. Not only is the oxford grey sweatshirt super versatile, but it's ridiculously comfy and comes in different colors. It's my go-to whenever I'm lounging around the apartment, and whenever it's too cold outside I throw this on with a pair of leggings and head out. It is hands-down my favorite sweatshirt now and that's a terrifying thing because I was very emotionally attached to some of my previous sweatshirts and nothing compares to this.. The sleeves are actually a little big long, which I love, and they bunch up at the bottom and make it the perfect sweatshirt to throw on at any time. They also run a little big - I'm usually a Medium and I got a Small and it fits perfectly. I have gotten so many compliments on them, and I find myself looking forward to Fall so I can start wearing this to my 8ams without getting the "it's still summer" looks from everyone around me.. Although it was 39 degrees yesterday morning, so I guess I'll be able to wear this sooner than I thought! Probably the only issue with this sweatshirt is that it doesn't have pockets.. but then again, who needs pockets when it's so comfy. It's lined with fleece on the inside, and if I didn't have to take it off from time to time, I probably wouldn't! 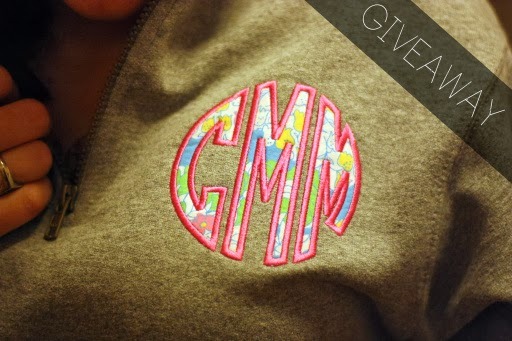 PLUS, if you're in a sorority, she can even monogram it with your letters on it! LILLY LETTERS! Lucky for you.. Christina and I are giving one of these away! 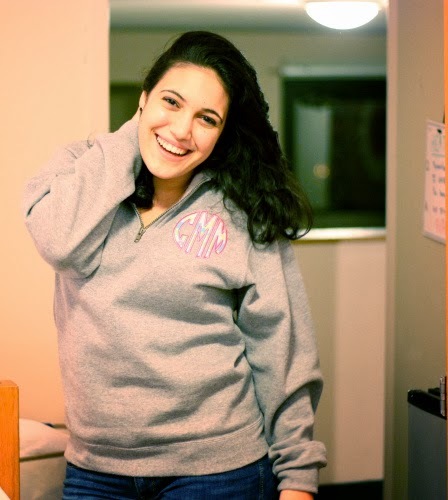 One lucky reader will win the comfiest sweater of their life, completely customized with their monogram in lilly fabrics.. good luck guys! The giveaway starts today and ends next Thursday 26th at 11:59pm. I'll email you if you won and give you 48 hours to respond. If you don't respond within 48 hours, then I will choose another winner. I will publicly announce the winner on my Friday Five the following day. 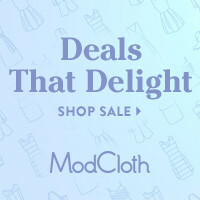 I'm not sure which lily fabric i would choose because i love them all! Caroline, you seriously have the best giveaways! 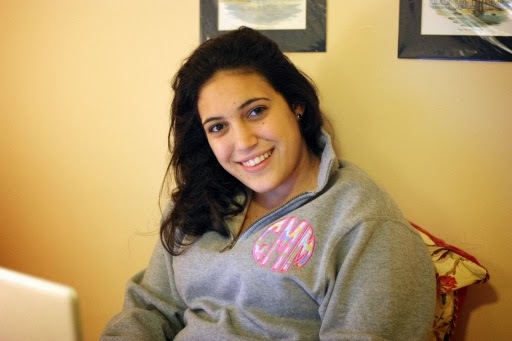 A Lilly monogrammed sweatshirt is just so you! Again, the pictures came out incredible! If I win, I would absolutely get the Lilly print of my sorority, Alpha Delta Pi! Thanks again for another awesome giveaway and just being incredible! I absolutely love the coronado crab print. It's my favorite!!!! That's the print I would definitely want on my monogram. My favorite print is Blue Lucky Charms, so if that's available I would LOVE that. This is one of the best giveaways I've seen! I love the Cyan Blue Rose!!!! My Reply didn't work right initially, but these are adorable!!!!!!! The CyanBlueRoseWater is my favorite! Totally wish I wasn't a broke college student and could just buy them all! I love the new Bait and Switch Lilly print. Also, you have such a cute blog! And what a lovely giveaway! I would adore to choose the let's cha cha print, as it's my favorite one! 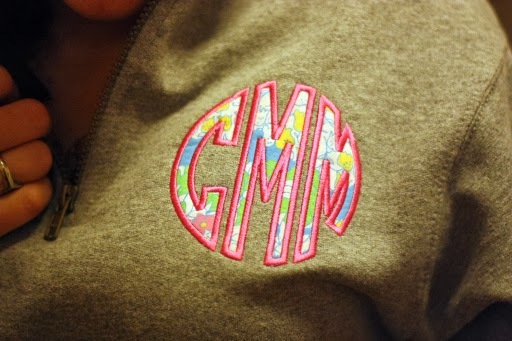 I've always wanted a quarter zip monogrammed pullover JUST like this one! This is adorable! I'd love the monogram in hotty pink first impressions! the Kappa Kappa Gamma print! My favorite Lilly prints are Stuffed Shells, Crown Jewels, and Lillypalooza but from what she offers I like #6 (blue/green shells) the best! I would love to have the fabric that you choose but I also like number 10 the little roses. That is just adorable. I would pick "Gimme Kiss" or 'Window Shopping"! I adore first impressions but I love them all so much! Great giveaway! From the swatches on the Etsy listing... I think I'd choose fabric #6! I love the Leo print and the print for Pi Phi and the new navy and pink elephant print is growing on me. But of the ones listed in your Etsy shop I would pick wither #9 (the green and navy leopard) or #10 (flowers). Thanks for hosting such an awesome giveaway! I would get the Cyan Blue Rose fabric! Of the ones she offers though I really like #8 because my wallet is that pattern!